But we all know better than that. Batman isn’t alone and couldn’t tackle even half of what he does without the solid assistance of his most trustworthy of sidekicks! Brought up from a young age as an amazing acrobat, Robin developed some serious skills and those tricks transferred perfectly to free-running and flipping over obstacles while assisting the Caped Crusader in his two-on-twenty fights with the notorious archvillains. You’ve raised your child right, which means that that kiddo is ready to do whatever it takes to help out any local buddies, especially Bats! 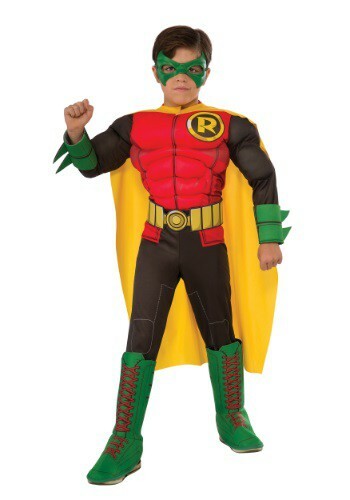 Fortunately, we’ve got the gear you need in this DC Comics Deluxe Child Robin costume. A comfortable padded jumpsuit will fill out your youngster’s worthy muscles and the iconic color scheme of red, green, and black (plus the flashy yellow cape) will make it look like Robin has stepped right out of the comic books, themselves! The imitation utility belt has your child ready to face any of the Arkham villains… but, don’t worry, you shouldn’t need any shark spray.